Ocean isn’t like your typical fine-dining restaurant. Firstly, it doesn’t boast a lavish dining room. Instead, it occupies a tiny 24-seat space inside some offbeat and run-down walk-up building. Secondly, you get soft hymns playing in the background and Jesus-themed memorabilia sprawled around the restaurant. In case you’re wondering – the restaurant is owned by a family of Christians, one who used to work behind the scenes as a chef at The Mandarin Oriental. There is only one set three-course dinner menu ($268) on offer with a choice between two main courses and an optional dessert (supplementary $38). The menu is tweaked on a regular basis but is always prefaced with an amuse bouche. On the night we visited, this complimentary snack arrived at the table as a whole lychee filled with light, carbonated fruit foam that fizzed away like soda on the tongue. 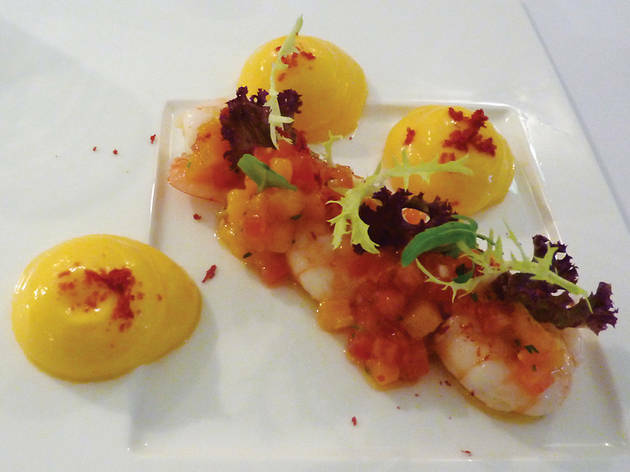 Following the hors d’œuvres, the meal settles in with a beautifully composed prawn salad decorated with lightly whipped blobs of sweet mango mousse. 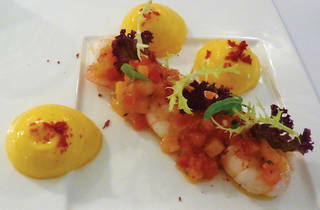 The flavours are mellow, brightened up slightly by a fresh and tangy mango and tomato salsa that sits atop the chilled shellfish. It’s good but not outstanding. The cream of mushroom soup on the other hand, deserves full attention. Dressed with just a light drizzle of olive oil, the unassuming bowl brims with the unadulterated natural goodness of fresh, earthy ‘shrooms. It’s a delightful reminder that sometimes the most basic things are also the most satisfying. Simplicity wins out again with the mains and the better dish is the one that has the fewer quirks and garnishes. Stewed beef cheeks rolled in al dente sheets of pasta with blistered mozza cheese are delicious – but the overload of elements on the plate detracts too much from the meat itself. Definitely go for the brilliantly succulent spring chicken instead, which is slow-cooked first at 63 degrees then pan-fried until the skin becomes a crisp, golden brown sheet. This is pretty much spot-on stuff, especially when served with a side of buttery mashed spuds and chicken jus. 1/F, 9 Sing Woo Rd, Happy Valley, 3480 0512; www.oceanhk.org. Thu-Tue 6pm-11pm. Closed Wed. Dinner for two: around $600. Cash only.